You are currently browsing the tag archive for the ‘Science & Technology’ tag. – To avoid a new reduction of the investment in R&D and innovation. In the last few years, the investment in R&D (chapter 46 of the State Budget) has suffered a cut of 4.2% in 2010 and 7.38% in 2011; for 2012, a further 8.65% cut is being considered (where the percentages refer to the cut with respect to the previous year). If the budget cut for 2012 is ratified, during those years the Public Research Organisms would have suffered an accumulated 30% reduction of the resources coming from the State Budget. Investment in R&D was 1.39% of GDP in 2010 and it is estimated that in 2011 it was less than 1.35%. In the mid-term, it should reach the mean EU-27 value of 2.3% and converge toward the European Council goal of 3%. – To include R&D and innovation among the “priority sectors” allowing hiring in public research organisms, universities and technological centers during the fiscal year 2012. This will avoid a “brain drain” that would take decades to reverse. “The Spanish production model (…) is exhausted, it is therefore necessary to promote a change through investment in research and innovation as a way to achieve a knowledge-based economy that guarantees a more balanced, diversified and sustainable growth.” These words, extracted from the Preamble of the Law of Science, Technology and Innovations, were approved in May 2011 by 99% of the members in the Spanish Congress and Senate, constituting a tacit National Agreement regarding the need to prioritize R+D and innovation. The diagnose is unequivocal and the solution has been identified. What is missing is that political leaders rise to their responsibilities by fulfilling this compromise. The approval of the 2012 budget by the Spanish Government and Parliament in the next few weeks is the time to demonstrate that compromise. The budget cuts currently being considered for R&D and innovation would cause grave long-term damage to the already weakened Spanish research system, both to its infrastructure and human resources. This would imply a loss in competitiveness, as has been recognized by the European Council. In the March 2, 2012 memorandum, the “European Council confirms research and innovation as drivers of growth and jobs (…). EU Heads of State and Government have today stressed (…) that Europe’s growth strategy and its comprehensive response to the challenges it is facing (…) requires the boost of innovation, research and development, (…) since they are a vital component of Europe’s future competitiveness and growth.” (MEMO/12/153). Given the above, we urge ask the Spanish political leaders to take the following considerations into account. The Royal Decree-Law 20/2011 of urgent measure to correct public deficit (BOE-A-2011-20638, Dec. 31st, 2011, Art. 3) establishes that “the hiring of personnel (…) will be restricted to sectors considered to be a priority”. It also says that during the year 2012, none of the permanent positions left vacant by retirees will be fulfilled, except in sectors considered to be a priority. The preamble of the Law of Science, Technology and Innovation cited above establishes that R&D and innovation are a priority. Therefore, the Royal Decree-Law 20/2011 allows to reactive public hiring in R+D, essential to strengthen research institutions. During the last three years, these institutions have suffered a drastic decrease in the number of new positions. For all public research organisms and the Spanish Research Council, and including all research levels (from laboratory personnel to research professors), the number of new positions amounted to a total of 681, 589, 106, 50 and 55, for the years of 2007, 2008, 2009, 2010 and 2011, respectively. The Government’s intention is to have zero positions in 2012. The situation is unsustainable: overall, the permanent staff at the public research organisms has an average age of 50-55 years, reaching 58 years at the Spanish Research Council. The number of researchers in the permanent staff is shrinking at an accelerated rate because, during the last year years, the positions left open due to retirements are not being filled. Meanwhile, the rest rest of the research staff is relegated, in the best scenario, to a concatenation of short-term contracts. The result is an important loss of competitiveness because forming a research group and obtain funding require a degree of stability that a great number of researchers in the peak of their scientific productivity do not enjoy, neither inside our outside civil service. In fact, it is urgent that the hiring system for researchers follows a more flexible model that allows the planning of human resources, indispensable to make strategic plans viable. Otherwise, the established goals will never be achieved and the abandonment of research lines will imply an important loss of investment. 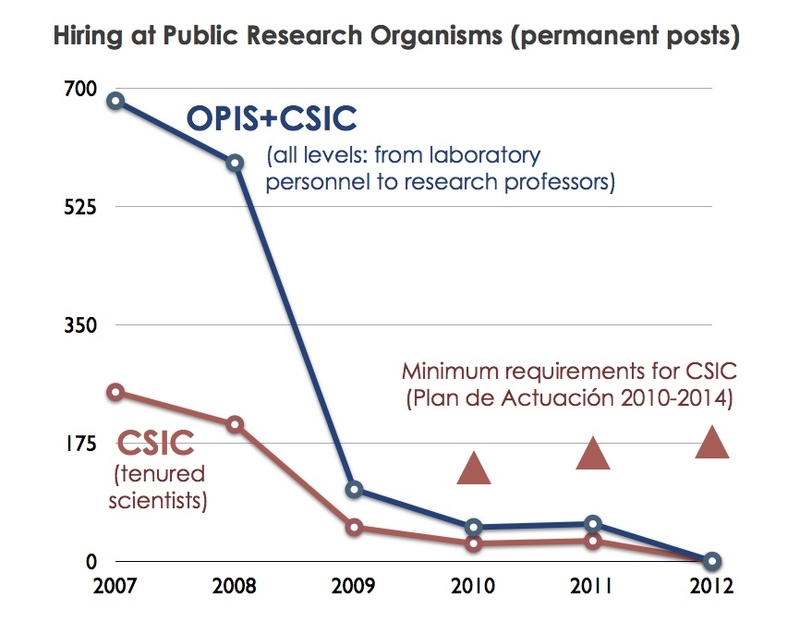 For example, CSIC, the largest research public organism constituted by 133 centers, received during the years 2010 and 2011 less than 20% of the minimum requirements in personnel establish in its strategic plan (Plan de Actuación 2010-2014). The other public research organisms are in a similar situation, or even worse. The lack of stability in the human resources policy of the Spanish R&D system damages its credibility and undermines its competitiveness. The “Ramón y Cajal Programme” is a good example (but its not the only one). Nationwide, this program is the flagship of the Spanish research system in terms of human resources. 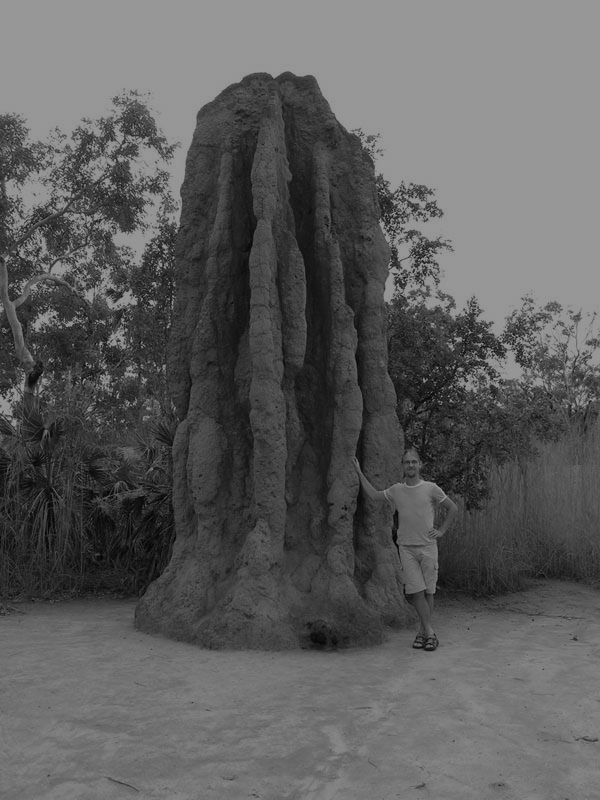 It was established in 2001 with a vision whose commitment is, and always has been, to offer the possibility of tenure to the researchers in this program that pass the two evaluations established within the 5-year trial period (during the second and forth year): is the Spanish “tenure-track”. However, only 37% of the researchers from the 2006 call that have passed all evaluations have become tenured (compared to 90% from 2001). The rate is significantly smaller for researchers from the 2007 call, whose contracts will be finishing in the next few months. On average, researchers who have completed “or are about to end” their contracts, are 42 years old, have dedicated 17 years to research, lead their research activities, have extensive international experience and participate in a wide network of international collaborations. There are many other researchers with a similar profile in the same position. It is urgent that the Spanish research system fulfills the commitments of its current tenure-track, and that it is modified to allow the planning of human resources that makes the tenure-track hiring model viable (the so-called access contract established by the Law of Science is far from being a tenure-track). The characteristics of scientific research require decades for the formation of a skilled workforce. 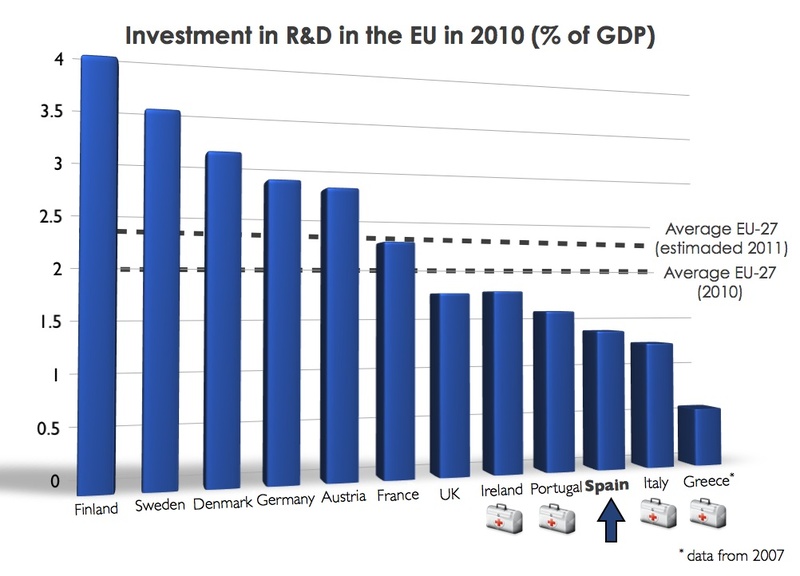 Spain does not harbour an R&D private sector that can absorb and take advantage of highly qualified researchers. This human resource, which has been trained thanks to a considerable national investment and is best prepared to contribute to the shift to a knowledge-based economy, will have no choice but to emigrate or leave research altogether. The country faces a multi-generational “brain drain” (from researchers starting their PhDs to those in the mid forties). Spain also risks the chance of undermining the interest towards science of the younger generations (now children and teenagers). Within a few years, Spain may have no choice but to import scientists. It will only be able to do so with costly offers that can compete with those of science-leading countries, whose human resource policies will have much greater credibility. If Spain does not take urgent action to preserve the scientific workforce of highest quality, the research system will take decades to recover, dragging down the desired shift to a knowledge-based economy. Investment in R&D needs to converge with the EU-27 average value and approach the 3% of GDP goal set by the European Council Lisbon Strategy. Investment in R&D was 1.39% of GDP in 2010 and it is estimated that in 2011 it was less than 1.35%. While the leading economies in the EU are near or above 2.5% (with three countries above 3%), the bailed-out countries or those that have suffered political intervention are well below 2.3% (the average investment in R&D in EU-27). Coincidence? Evidently not: none of the counties economically healthy that are in the leading group of the EU have allowed themselves to fall behind in R&D. Investment in R&D must be stable and independent of political and economic cycles. The lack of stability, an endemic evil in the Spanish research system, causes a loss of effectiveness and credibility. In the last few years, the investment in R&D (chapter 46 of the State Budget) has suffered a cut of 4.2% in 2010 and 7.38% in 2011; for 2012, a further 8.65% cut is being considered (where the percentages refer to the cut with respect to the previous year). 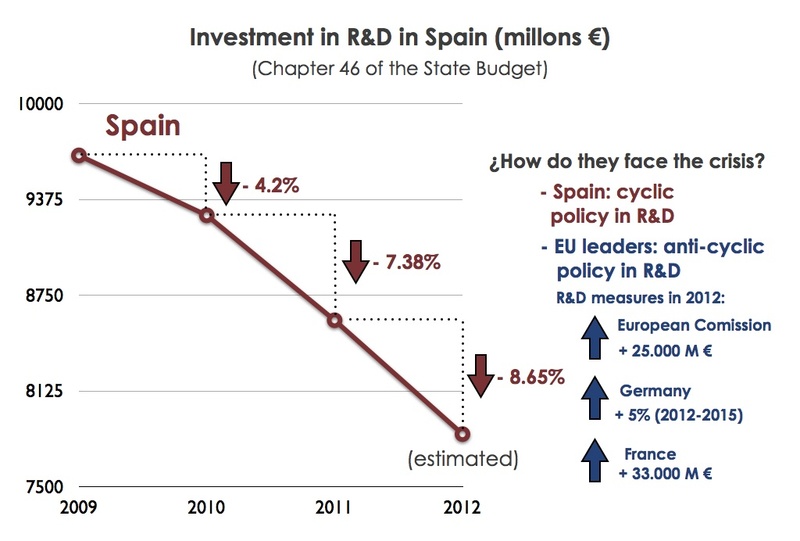 Spain follows a cyclical policy for R&D, which makes the country even more vulnerable when the economy is in crisis, cutting off possible means of recovery. Contrarily, many research-leading countries have adopted an anti-cyclical policy, increasing investment on R&D as the economy shrinks. In 2012, France has announced a stimulus package of € 35,000 M for research, while Germany, a champion of austerity, is rising by 5% the budget of its main research organizations until 2015 (including the Max Planck Institute and the Deutsche Forschungsgemeinschaft (German Research Foundation). Furthermore, on March 2, 2012, the European Commission, with the support of the Spanish government, proposed to significantly increase the European investment in R&D from € 55,000 M in 2007-2013 to € 80,000 M in 2014 -2020 (MEMO/12/153). A knowledge-based economy will only be successful if it guarantees the stability of the research system in terms of financial and human resources, and if there is a private sector committed to research and innovation. To promote the latter, the European Investment Bank and the European Commission created in 2007 the Risk Sharing Finance Facility (RSFF). However, if Spain does not prevent the loss of researchers, the Spanish research system will take decades to recover due to a double factor: Spanish private companies will not find qualified research staff to take advantage of these European financial resources, nor will Spanish public research institutions have a workforce to benefit from the economic grants from the European Commission (€ 80,000 M in 2014-2020). The change to a knowledge-based economy, which could take decades to achieve, should not be measured in legislature terms and requires a National Agreement that shields it from political and economic cycles. It is a matter of national importance and should be considered a priority. In the words of the Minister of Economy and Competitiveness, Luis de Guindos “we are going to make R&D the base for future development of the Spanish economy (…) and benefit from the human resources we have and develop a research career” (Plenary Session of the Congress, 02/21/2012). Political leaders must be coherent with the message they are sending to the Spanish society and to other countries and investors: they cannot keep the rhetoric of change to a knowledge-based economy, while every step they take is in the opposite direction, producing inevitably serious short and long-term damage to the scientific infrastructure and its human resource that can only lead us to a knowledge-borrowed economy with little know-how. “If you think education is expensive, try ignorance” (Derek Bok). Fig. – First Difference Engine. This impression from a woodcut was printed in 1853 showing a portion of the Difference Engine that was built in 1833 by Charles Babbage, an English mathematician, philosopher, inventor, and mechanical engineer who originated the concept of a programmable computer. “If all you have is a hammer, everything looks like to you as a nail” ~ Abraham Maslow, in “The Psychology of Science“, 1966. “Propose to an Englishman any principle, or any instrument, however admirable, and you will observe that the whole effort of the English mind is directed to find a difficulty, a defect, or an impossibility in it. If you speak to him of a machine for peeling a potato, he will pronounce it impossible: if you peel a potato with it before his eyes, he will declare it useless, because it will not slice a pineapple. 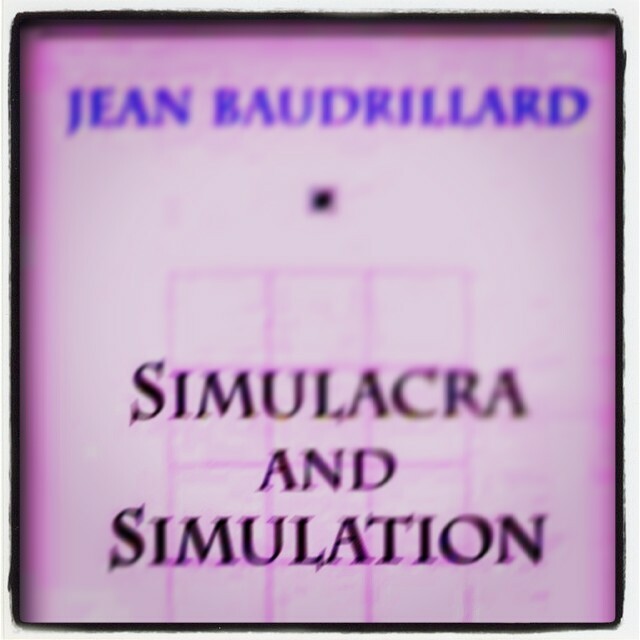 […] Impart the same principle or show the same machine to an American or to one of our Colonists, and you will observe that the whole effort of his mind is to find some new application of the principle, some new use for the instrument“. ~ Charles Babbage quoted in Richard H. Babbage (1948), “The Work of Charles Babbage“, Annals of the Computation Laboratory of Harvard University, vol. 16. At the beginning of the 1820’s, Babbage worked on a prototype of his first difference engine. Some parts of this prototype still survive in the Museum of the history of science in Oxford. This prototype evolved into the “first difference engine.” It remained unfinished and the completed fragment is located at the Museum of Science in London. This first difference engine would have been composed of around 25.000 parts, weighed around fourteen tons (13.600 kg), being 2.4 meters tall. Although it was never completed. He later designed an improved version, “Difference Engine No. 2”, which was not constructed until 1989–91, using Babbage‘s plans and 19th century manufacturing tolerances. It performed its first calculation at the London Science Museum returning results to 31 digits, far more than the average modern pocket calculator. 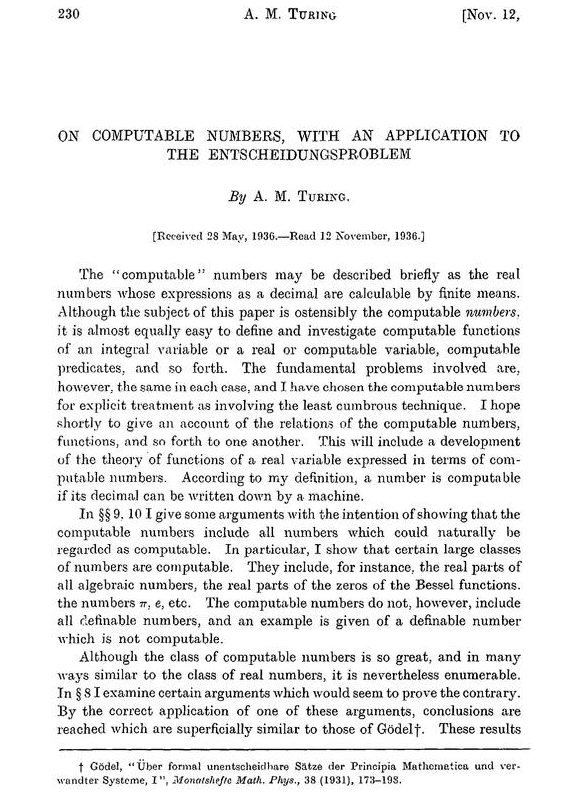 (check Charles Babbage Wikipedia entry for more). Video – “Intel Star” TV ad – Who’s your rock star? – Rather than focusing on a new product, the 2009 “Sponsors of Tomorrow” ad campaign celebrates what makes Intel different culture, personality, heroes – and ways Intel has helped change the world for over 40 years. 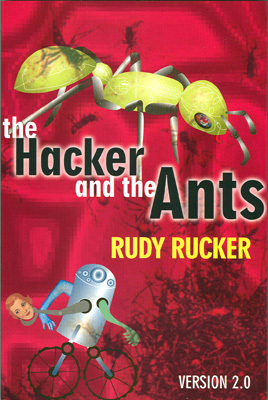 Featuring Ajay Bhatt co-inventor of USB !